The 134th Annual Session of the Connecticut State Grange is in the books. This year was an election year and a new slate of officers was elected. I had the privilege of being elected as your new State Master/ President. I would like to thank the Delegates of the Connecticut State Grange for having the confidence in me to lead your State Grange for the next two years. For those who do not know me, here is a short profile of my family and Grange, and organizations I belong to. I live in Canaan, Connecticut along with my wife, Sharon Russell. We have been married for 35 years. We have three children, two boys and one girl and six grandchildren. I retired this past summer after 55 years of being employed at Freund’s Farm. I was the herdsman on the farm and had a small herd of cows that I milked at the farm. I joined Laurel Grange #210 in 1971 and when it closed in 1997, I joined Riverton Grange #169. I’ve been a member of the Grange for 47 years. I’m a Past Master of Laurel Grange and a past Master of Mountain County Pomona No. 4. At the state level I was Agricultural Chairman, Deputy, General Deputy, Gatekeeper, Assistant Steward and Overseer. I was the dairy superintendent for the Connecticut Agricultural Fair sponsored by the Connecticut State Grange for 30 years. Other organizations that I have belonged to include the Housatonic Valley FFA Alumni. I helped to organize and was the first President of the FFA Alumni. I am also a member of Farm Bureau, Litchfield County Dairy Committee and Genex A.I. I was also an alternate delegate and delegate for many years. I presently belong to the National and New England Holstein Association. With this short profile, you can see I am a strong supporter of agriculture, especially the dairy industry. 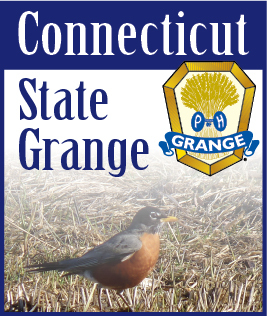 I am still looking for Grange members who would like to be on a committee for the State Grange. Please let me know if you are interested. It’s a great way to support your Connecticut State Grange and get involved. By the time you read this article my wife and I will be in Stowe, Vermont at the National Grange Session as your delegates. Let’s hope we don’t get snowed in!